Do you remember when you first discovered there were such things as elephants? And didn’t childish intuition tell you at once that these animals were among the world’s most wonderful creatures? Over the last few decades scientists have proved that they are in fact wonderful – and in all sorts of ways, not least their ability to communicate over large distances. Then there is their highly developed matriarchal society. They are also one of the most intelligent species on earth. They are good at problem solving. There are many cases of their altruistic acts. For instance they have been known to help wounded humans in the bush, even going so far as placing exposed individuals in the shade, and then keeping guard over them against predators. But proof apart, it is probably anyway beyond most people’s comprehension that some forms of humanity see elephants purely as a resource – killing them for ivory, or a trophy head to brag about to their shooting chums. The word elephant, I’ve just read somewhere on Google, comes from the Greek word elephas meaning ivory, so already we have a clue as to the literate world’s (one hesitates to use the word ‘civilized’ here) once primary relationship with elephants. But then this is not the only kind of man-elephant relationship. The killing of elephants is not always about the pursuit of luxury goods. Indigenous African peoples, such as the small-statured Mbuti hunters of the the Congo forests, have long hunted elephant for food, and also possibly scavenged dead ones. One beast, killed once in a while would keep a hunting band going for many days as well as providing large amounts of meat to trade with farming neighbours for other goods. The fact that there have always been hunters like the Mbuti who will tackle an elephant, makes them in turn desirable allies and trading partners to less brave outsiders who crave only the ivory. In East Africa, from at least the start of the first millennium AD, Arab dhow merchants relied on locals like the Akamba people to bring ivory to the coast to trade. In the nineteenth century the Swahili slavers set off into the interior to grab for themselves a combination haul of humans and ivory, the poor human captives being forced, while they still lived, to carry the elephant tusks hundreds of miles back to the coast. There are far older stories too. The tomb biography of Prince Harkhuf of Elephantine records that four thousand years ago this Ancient Egyptian general headed at least four major expeditions into the African interior. One objective was to test the waters for a take-over of the neighbouring Kingdom of Nubia. But there were also valuable resources to garner: ivory, leopard skins, ebony, precious stones. One expedition went beyond the Mountains of the Moon, the Rwenzori Mountains on the borders of Uganda and Eastern Congo, and so into the territory of Mbuti hunters. The tomb account includes a letter from Harkhuf’s Pharaoh, Pepi II Neferkare who, on becoming Egypt’s ruler at the age of six, longed for nothing more than his own pygmy, he “who danceth like the god”. The letter contains strict instructions as to the pygmy’s care, and especially on the voyage back down the Nile so that he does not fall in the river. Anyone who has read Colin Turnbull’s The Forest People, will know that the Mbuti are renowned for their performances of complex polyphonic singing and energetic dancing conducted in praise of their Forest Creator. Neferkare’s letter would suggest that the Mbuti were already well known to the Egyptians thousands of miles away, and the primary source of this relationship was mostly likely to have been the Mbuti’s provision of forest produce including ivory. But the biggest assault on elephant-kind has all to do with the arrival of the gun. A major killing spree began in the late 1800s in the Congo – then a private fiefdom of Leopold II of Belgium (think Joseph Conrad’s Heart of Darkness and the Congo River stations set up especially to export ivory and wild rubber from the forest hinterland). In East Africa the slaughter began at a similar time under British colonial rule – first British and European aristocrats out to make their fortunes, then by hunters,like John Hunter, employed by the colonial administration to protect settler plantations from elephant damage. The ivory hunters of course always sought out the animals with the biggest tusks. So much so, that when the likes of Denys Finch Hatton and aviator, Beryl Markham began scouting for ivory from the air, the big bulls of Tsavo were reputed to hide their tusks in the undergrowth whenever they heard a plane. What was taking place, then, was a most unnatural selection. 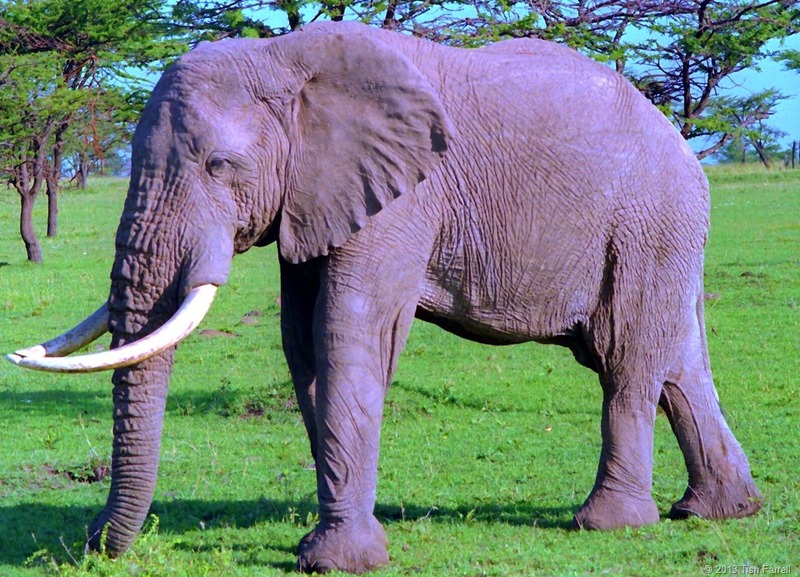 The biggest and best elephants had the biggest and best ivory. The gene pool of present day elephants has thus been ravaged by a century of mass killing. After the colonial era, the armies of civil war conflicts across the continent, continued the job started by colonial sportsmen and administrators. After the Idi Amin regime in Uganda when much wildlife was decimated, the tusks of the elephant population that gradually re-established itself were either puny or did not develop at all. And an elephant needs his tusks – not least for rearranging the landscape (clearing trees to favour grass growth) and mining for water sources and essential mineral salts. And why did this killing begin? Because humans thought that ivory re-fashioned into billiard balls, piano keys, and objets d’art was more valuable than embedded in living, breathing elephants. Some people still think this. But back to the elephants and those extraordinary things that scientists have been discovering about them. For one thing, the infra-sound throat rumbles that vibrate through the earth can convey information to other elephants at least six miles away. It would appear, too, that they can pick up seismic movements over far greater distances than this. Researchers have observed that when it started thundering in Angola, thus signalling the start of the rains and fresh browse in that quarter, elephants one hundred miles away in Etosha National Park, Namibia, set off there. Apparently the tips of trunks, toes and heels are especially sensitive to vibration. Working Asiatic elephants have also been known to detect tsunamis and make for higher ground, thus saving any humans who happened to be riding on them at the time. 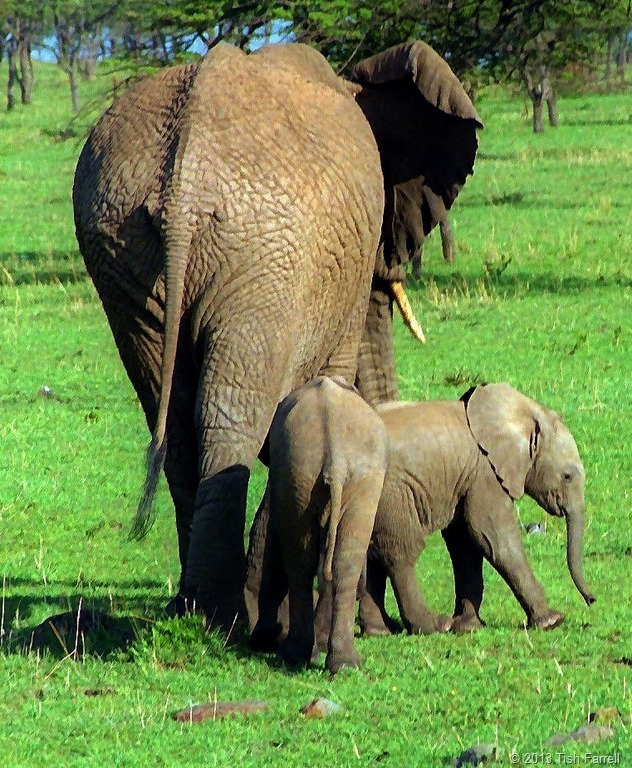 When it comes to communicating amongst the immediate herd or with potential predators, elephants have a whole range of calls and gestures, depending on the circumstances. These include ear-splitting screams and trumpeting, rumbles and grunts, crying and barking, head shaking and ear-flapping, trunk slapping, dust-kicking, throwing missiles, ear spreading, standing tall, and making mock and real charges. While their eyesight is not acute, and especially in bright light conditions, they have a keen sense of smell. An elephant will thus continuously read its environment and, using the tip of its trunk like an antenna, decode all manner of messages by scanning urine, faeces, saliva, and the secretions from their fellows’ temporal glands (found on the side of the head mid way between the eye and ear). Also, when it comes to acts of aggression from humans, elephants will remember these and continue to identify such aggressors by their smell. And that’s the other marvellous thing. Elephants do remember. For much of the year the males and females live separately usually only congregating for mating purposes. 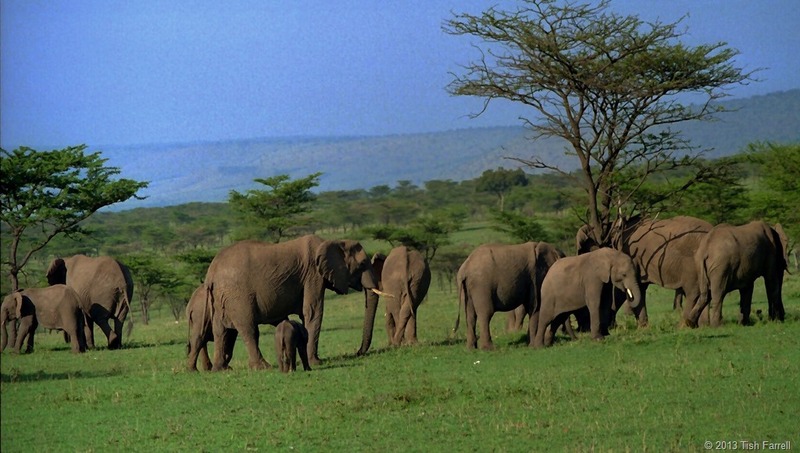 The females roam in small family groups led by an old matriarch. Within that matriarch’s head is a lifetime’s accumulated wisdom that she uses to manage her daughters, granddaughters and their offspring, and so keep them healthy and safe. Elephants left bereft of their elders through culling or poaching, are known to flounder and panic without the old ones’ guidance. As you can see from some of these photos, mostly taken outside the national park in Kenya’s Maasai Mara, elephants are not only highly sociable, but also very tactile. 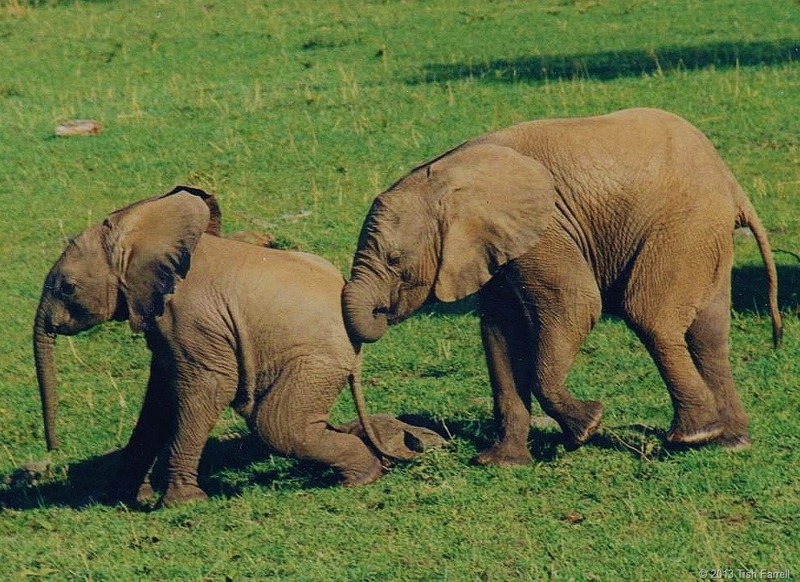 They spend much time wiggling against each other and touching each other with their trunks. Even older elephants like to play, and there are a whole range of gestures that they use to invite general romping. As the work of Daphne Sheldrick has shown at her Nairobi elephant orphanage, an orphaned elephant will die, not so much because it is short of food, although the right infant milk formula is very important, but because it does not have a continuous show of affection and reassurance from family members. 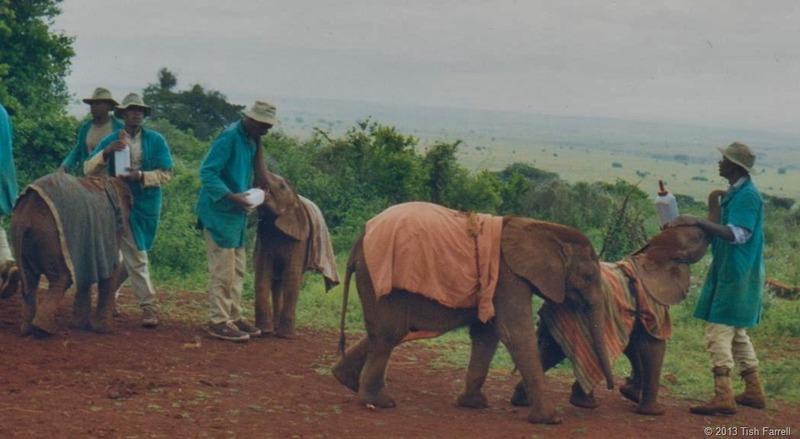 Sheldrick has learned how to provide for this vital need by assigning a human keeper-parent to every baby; duties, apart from feeding and playing, include spending the night with their charges. When the time comes to repatriate adolescent elephants to the wild, the lack of matriarchal knowledge creates a considerable challenge to making a viable transition. This was well shown in the BBC series The Elephant Diaries. More sobering to learn is the fact that elephants, not only have a similar life-span to us, but they also do understand death. In the past, conservationists have found to their cost that elephants are utterly traumatized by witnessing culling events. Where elephants have been wounded by poachers, their comrades will stay beside them and try to lift them or feed them grass. Once an elephant has died, the herd may remain with the corpse of several days. The young ones have been seen to cry. The survivors will then cover the dead one with branches, leaves and grass. 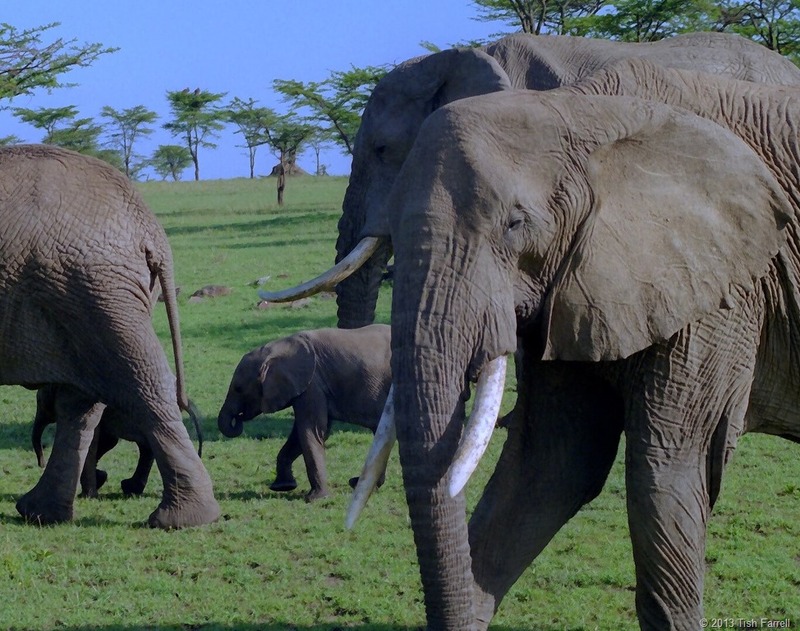 During colonial times, a Kenyan district officer once confiscated a poachers’ stash of ivory, only to find that in the night, the local elephants broke into the store and carried off the tusks. There is, though, another side of the elephant-man story, and especially where they compete for the same territory. 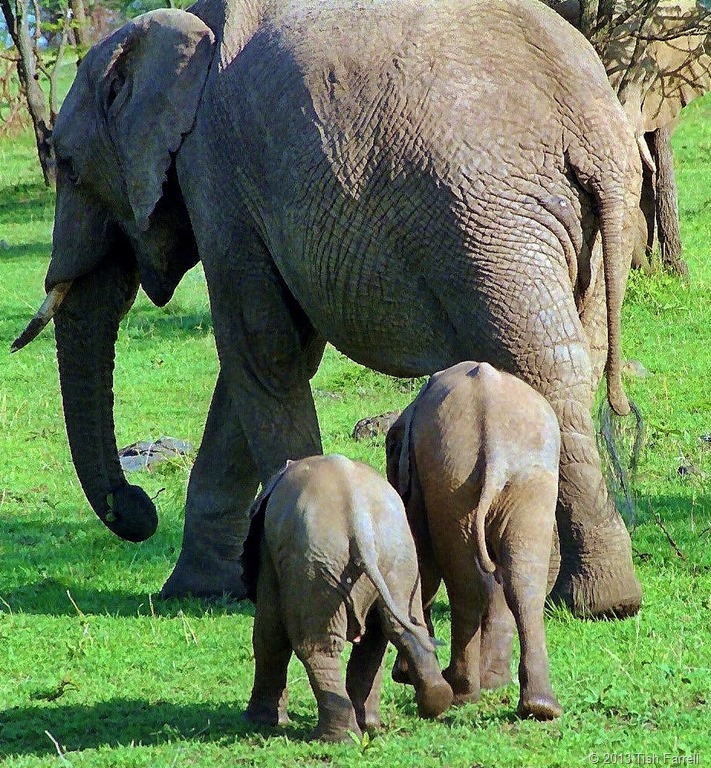 In a single night’s foraging, elephants can wipe out a whole season’s crops in a farmer’s smallholding, and that means starvation for the family concerned. They will also kill humans if they consider themselves provoked. Bulls in must are quickly irritated and are especially dangerous at such times, as are mothers with small calves. In poor communities poaching ivory can become an attractive proposition where local bigwigs and foreign buyers seem to be offering them a small fortune to do so. The only way to protect both elephants and would-be local poachers is to give communities reasons to protect elephants. That means a fair cut of tourist dollars to provide for schools and clinics and a a better standard of living all round. 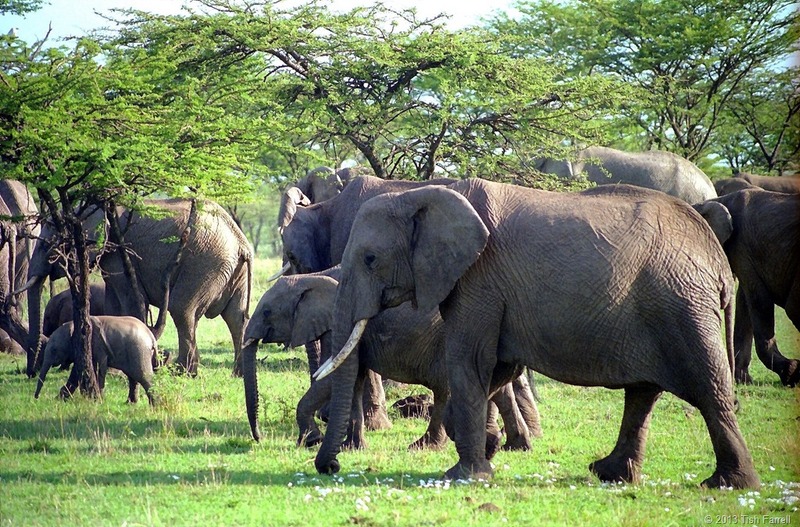 There are many thousands of elephants still roaming African, but they are always under threat. Most nations’ wildlife parks are under-resourced when it comes to vehicles, equipment and manpower. Much protection of wildlife is in fact done by owners of private game reserves in conjunction with local communities. In the meantime, we need to thank those African rangers, men and women, who daily risk their lives for often little pay, to protect their countries’ wildlife from human rapine. They are indeed true heroes. We might also stop to ponder on whether some of the resource grabbers funding the poachers might not have closer connections to our own lives than we care to admit. Posted on November 14, 2013 November 14, 2013 by Tish Farrell	This entry was posted in Africa, photography, Travel, Wildlife conservation and tagged #amwriting, Ancient Egyptians, elephant communication, elephants, Harkhuf, hunting, ivory poaching, Mbuti, Pepi II Neferkare, Tish Farrell, wplongform. Bookmark the permalink. Thank you for this very well researched and interesting post. I hold the elephant in the highest of regard, and like so many of the species that we share this planet with….to destroy them is in many ways an act of human self destruction. yes, we so diminish ourselves by not honouring the natural world. 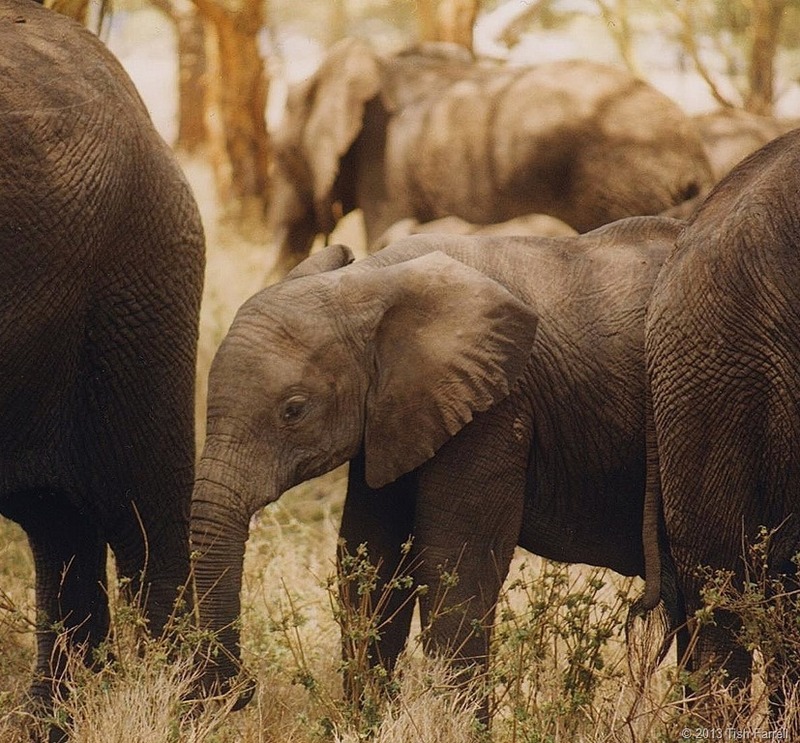 hi Tish, you’ve posted such a heart touching tribute to elephants! Thank you, Frizz. They deserve our tributes don’t they. Thank you for the re-blog. Just been to your blog. V. interesting so shall be back. Thank you Tish for this wonderful tribute to elephants. I have tremendous respect for them and have always felt privileged to visit their kingdoms. It is so sad those kingdoms are endangered by man. Thank you. And yes that sums it up, feeling privileged to have visited. Such beautiful photos. Such wonderful animals. Yet so much sadness surrounding them. I think they are truly magestic creatures. Thank you for this informative and heart-felt celebration of elephants, Tish. How could anyone not love them? BTW, Is there a collective noun for elephants? I know that a collection of elephants is most commonly known as a herd but I have just found out that a group can also be called a memory of elephants, which is so fitting. I’m sure we could think of many more words to describe how wonderful they are. A memory of elephants – that’s wonderful, Kate. And there could be a rumble of elephants. I love elephants and I hate hunting, especially trophy hunting. If you aren’t going to eat it, you can’t kill it unless it’s trying to kill you. I can also understand the plight of the desperately poor small farmers trying to survive. It’s a horrible situation that I hope can be resolved before it’s too late for the elephants. Quite agree on the trophy hunting. All is not lost on the elephant versus farmer front. There are all sorts of cunning schemes. Planting a boundary of chili plants has worked in some areas. Also eco-tourism where villagers are given an alternative source of income by being helped to host the more adventurous traveller. They then have a vested interest in preserving wildlife – former elephant enemies become ‘our elephants’. You’re welcome, Tish. Your elephant post is spectacular! That’s amazing, the picture of the elephants. Unfortunately, our cultural memories of elephants are connected to some very difficult experiences… when invaders used elephants like tanks, to intimidate and oppress our people. But still, from the first time I saw pictures of them… and later when I saw a few in zoos, I just loved these animals who seemed very clever and very steady. It’s a shame that elephants have been implicated in humans’ dark intentions, Shimon, but yes, they seem very reflective animals. Was thinking of your elephants as I wrote this, Bumba. Tish, early this year some two young Kenyan men saw an elephant in the forest and rushed to it in order to take photographs while holding its trunk. But the animal, wild and infuriated, stamped them to death. The wildlife officers later shot it down. Yet the young me had provoked the innocent animal. A similar incident happened in South Africa when two tourists got to near to an unfriendly elephant. It injured them and the rangers shot it down. And my friend, who works at the Karen Blixen Camp, told me that usually when an animal attacks a human being, the rangers must find it and kill it forthwith, even if the human had wantonly provoked it. I have wondered at this. Countless animals have been killed consequent to human stupidity. And it continues in the same vein. Why don’t the rangers stop people from getting too close to the animals? It is strange that they’d rather wait to murder the animal, who’d have continued to live had the humans kept their distance. Yes, this is truly upsetting, Peter. I have seen tourists provoke sleeping lions because they want ‘a better’ photo. I don’t know why rangers aren’t more proactive. E.g. It wouldn’t hurt to give all visitors to reserves a quick lecture as they buy tickets. ‘These animals are dangerous. Please respect them, and do not approach in any circumstances.” Not hard is it. Not hard at all. They just aren’t proactive as you say.